Now that the holidays have passed and life must return to normal, it’s time to pack up the decorations again. 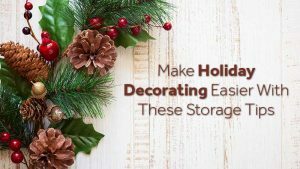 If you go all out for Christmas, adding new decorative items each year, you may be reaching the limit of your storage space. With these storage tips, you can stash your decorations in a more organized way which can help save space. If nothing else, it will make next year’s decorating go more smoothly. 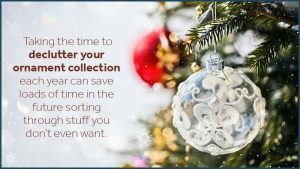 If you prefer the safety of an artificial Christmas tree, you can save time and headaches next year by keeping it stored assembled in a bag designed for that purpose. You could even bag it with its lights and decorations, eliminating the need to store those items separately. Rather than using large trash bags, store your holiday wreaths in hard cases. This way, you can stack them and go vertical in your storage area. For the tree ornaments, you can buy clear plastic storage boxes with customizable dividers. By not allowing them to move about in the box, they will remain intact. Just don’t stack anything heavy on top of your delicate baubles. But don’t stop there, you can find clear storage boxes in just about any size and shape to use for all your smaller decorations. Having the ability to peer inside each box will cut down on your searches next year. Alternatively, you can acquire shaped, zippered bags with carrying handles. Those may be better for heavier items such as nativity scenes and miniature villages. Oh, those beautiful colored lights! If only they were in season all year round. Then we wouldn’t have to deal with the tangled mess. But wait! On the market are reels designed specifically for those indoor and outdoor light strings. If you’d rather not do such fanciness, try wrapping them around shoe boxes or anything large enough to allow for careful spooling. Long holiday linens hang nicely out of the way in a spare closet in clear garment bags or in under-the-bed storage boxes. Now, how to organize your holiday stuff? It’s best to label each box or bag, categorize them and store them all together. That way, you aren’t tearing up several areas of the house pulling them back out next year. If you’re cramped for storage space, you should definitely gift yourself a portable storage service. Zippy Shell of Columbus offers affordable solutions to your storage shortage. Just give us a call to discuss the right option for you. Then, we’ll deliver a portable storagecontainer to your house. Call us again when you’ve finished loading, and we’ll come remove it to our secure, temperature-controlled warehouse until you’re ready for it again. Don’t forget to as about our current storage specials!